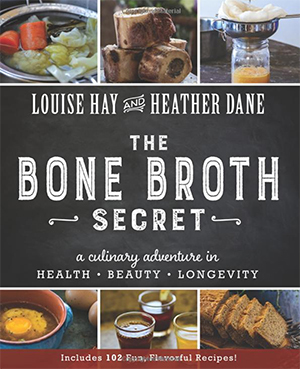 The actual “bone broth secret” isn’t that it’s a magical elixir that will fix everything in your life. The secret is that bone broth is gelatin. The golden, hand-wringing, full-of-promises bone broth from a food truck or on the shelf at the precious upscale grocery is made from the very same gelatin as the little box of mango Jell-O you buy for seventy cents. It’s a solution of gelatin in water. One has sweetener and artificial flavors, and the other has salt and savory aromatic flavors from a combination of meat, vegetables and herbs. The infamous five-pound bag of sugar-free gummy bears? Also made mostly of gelatin. Industrially, gelatin is made by boiling bones, tendons and skin, mostly from cows and pigs. The fat is separated, and it’s filtered, dried, and ground into powder. Apart from the steps that turn it into powder, this is exactly how you make bone broth. Or, as our ancestors called it, “stock.” In fact, the next time you’re cooking using regular chicken broth, toss in a packet’s worth of unflavored gelatin. You have now turned your chicken broth into BONE BROTH. No, it’s not as good as if you made stock from scratch, but it gets you most of the way there, and unless you’re drinking it straight, it’ll be indistinguishable. Back to the book. Is stock a life-extending, weight-loss, and beauty miracle? Probably not, sort of, and kinda, respectively. If you replace high-calorie-density foods with cups of soup, leading to a lower daily calorie intake, yes, you’ll lose some weight. If you’re overweight, and you lose weight, yes, you have a chance of living longer. This all supposes that you are able to maintain a calorie deficit over time by drinking soup, which relies on self-control and an acceptance of the symptoms that accompany long-term calorie deficit, such as hunger and fatigue. Collagen (the protein in bones and tendons that’s converted to gelatin when cooked) has been shown to improve skin elasticity, which we lose as we age. So this part might actually be true, if you define “beauty” solely as a function of skin elasticity and moisture. I was skeptical, but if you’re curious, you can dig up some double-blind studies showing this very thing. What’s our conclusion here? Soup is not new, and it’s still okay to eat soup, and it probably won’t fix your entire life if you drink it out of a cup, or a bone broth K-Cup, instead of a bowl. Help me keep making The Worst Things For Sale. I rely on donations to fund The Worst Things For Sale (as well as my daily comics, Toothpaste For Dinner & Married To The Sea.) If you have $0.10 a day you’re not using, drop it into my Patreon page here and you can help keep me online writing and making comics 365 days a year. No idea what that guy up there is doing, btw, but it’s mesmerizing. This man spent years, perhaps decades, crafting his body into a machine of physical strength and endurance. 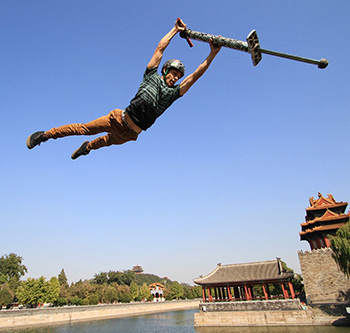 It’s a shame that the manufacturer used this picture of him to advertise their pogo stick, which clearly was the cause of the horrific accident that happened less than a second after it was taken. Then again, it makes more sense than the picture of a hang-glider that some customer submitted with his review.